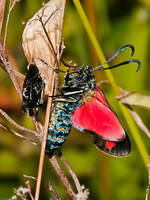 This is a large order of insects which includes both Butterflies and Moths. The name, Lepidoptera, is of Greek origin meaning wings with scales (Lepis=scale and pteron=wing). This feature defines these insects from other invertebrates. 1. Butterflies have clubbed Antennae whilst that of moths are usually fine and filiamentous. 2. Moths have a coupling device to lock the forewing to the hind wing. Butterflies lack this. 3. Butterflies mostly fly during the day in sunny or bright conditions. Most moths fly at night. Despite the difficulty in separation, the following families within Lepidoptera are considered butterflies. Papilionidae - Swallowtails and Birdwings which are not seen in the UK. 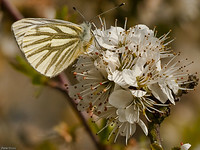 Pieridae - White or Yellow white butterflies. Lycaenidae - Blues and coppers. Nymphalidae - Brush foot butterflies. Satyridae - Mainly Brown butterflies. Note that Danainae (or Danaids) were originally a separate family (Danaidae) but are now grouped with Nymphalidae.